Matt C: A surprisingly busy week for my pull-list, but I guess I was about due one of those sooner or later. Top of the pile is East Of West #1, the new Image book from Jonathan Hickman, which the blurb says involves a dystopian future and the Four Horsemen of The Apocalypse trying to kill the President of the United States. Hickman is currently on fire with his Avengers books at Marvel at the moment, and it’s always great to see him work outside the shackles of established continuity in a creator-owned capacity. I do have concerns about signing up for his indie stuff as in the past some titles have been beset by long delays (Red Mass For Mars), gone on an extended hiatus (Secret) or just disappeared off the schedules without explanation (Feel Better Now), but his output is generally of such a high standard that I find it hard to resist anything with his name on it. Amongst a number of other titles from Image that I’ll be taking home this week, Think Tank #6 stands out, as it’s probably one of the best comics out there that not enough people are reading. Another book that falls into that category is the wonderful, mathematical fairy tale, Finding Gossamyr, which reaches the end of its first arc this Wednesday, hopefully to reappear very soon. The week’s big Marvel book has to be Guardians Of The Galaxy #1, and I’m unexpectedly excited to see how that turns out after such a strong prologue in #0.1. Not a DC title in sight, but still more than enough to keep me busy! Stewart R: It’s finally here!! East of West #1 is my big title of the week and I honestly cannot wait to get inside and see what Jonathan Hickman and Nick Dragotta are going to bring us in this science fiction tale of a wasteland America. Let’s face it, Hickman is on quite the run presently with the compelling complexity of his Avengers and New Avengers work putting in good numbers with Marvel, and Nick Dragotta has been an artist on the rise for a few years now having impressed on Vengeance and FF . 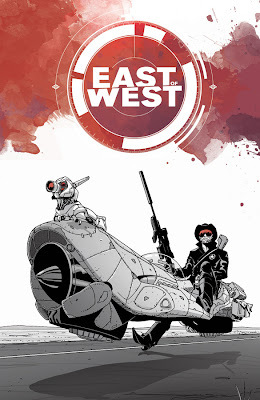 The promise with East Of West is that it’s a monthly ongoing, and while Hickman was less than reliable with his Secret title for Image, I’ve high hopes that this creative team can build something awesome and keep to a regular schedule. The further we get into Paul Jenkins and Carlos Magno’s Deathmatch series the more I’m impressed by the broad scope of character that these guys are able to deliver and how engrossed I am already in the strange lethal mystery that the group of heroes and villains have found themselves wrapped up in. Following the twist ending to the last issue I’m certain that #4 will be one of the first things I read this week. And speaking of firsts, how could we forget Marvel’s big player this Wednesday in the form of Guardians of the Galaxy #1 from Brian Michael Bendis and Steve McNiven?! I was certainly underwhelmed by the #0 issue that Marvel put out last month, but have been pleased with the digital Guardians Infinite comics that they’ve also been releasing and I suspect that this true debut may be a little more action packed in order to grab the readership’s attention. And grab my attention is something that Ken Garing did with his creator owned series of a marooned soldier on an alien world and as Planetoid #5 hits shelves tomorrow I really am happy to hear that Garing has plans to do a further miniseries based in this strange universe in the near future!